Examples, solutions, videos, activities and worksheets that are suitable for A Level Maths to help students answer questions on integration. 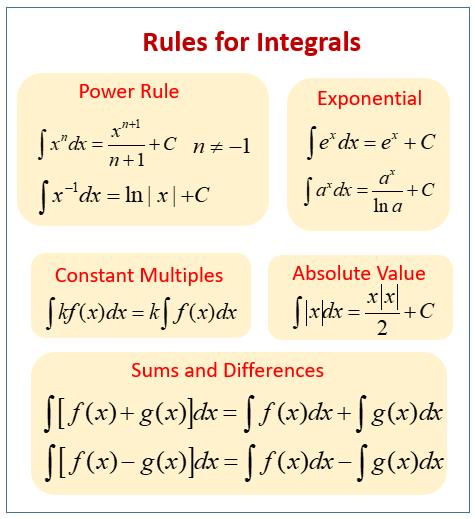 The following diagrams show some examples of Integration Rules: Power Rule, Exponential Rule, Constant Multiple, Absolute Value, Sums and Difference. Scroll down the page for more examples and solutions on how to integrate using some rules of integrals. How to find antiderivatives, or indefinite integrals, using basic integration rules. How to integrate a polynomial with the power rule? How to integrate x-1, or 1/x, with the log rule How to use algebra to rewrite before integrating, separate the numerator of a fraction, or expand a product in order to use the power rule. Basic Trig and Exponential examples that use rules from the Table of Integrals, as well as trig identities. (a) use integration to find f(x). (b) Hence show that f(x) = x(2x + 3)(x - 4). (c) In the space provided on page 17, sketch C, showing the coordinates of the points where C crosses the x-axis. Worked solution to the above core 1 question on integration. Short question on basic integration. Worked solution to this question on integration.